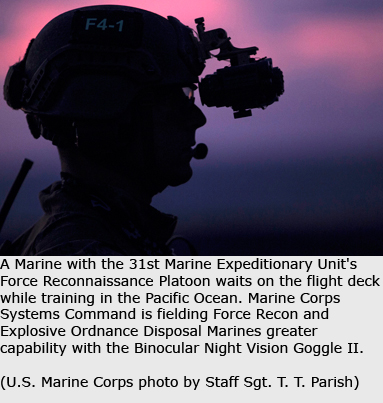 The Navy League’s online “Seapower Magazine” has a short post about new equipment being used by Marine Recon and EOD reminded me once again that perhaps the Coast Guard could use more night vision and thermal imaging devices. Do ships’ look-outs have the use of night vision devices? They could help even normal operations, particularly in rain or fog. Might help find a person in the water in low vis situations or detect a Self Propelled semi-submersible. We probably don’t need the depth perception provided by the binocular devices. Wonder if there are any of the earlier versions might be available from DOD as excess property? Looks like the price is about $4000 now. Not a lot when you consider how much it costs to run a ship per op-day. There are gimballed and plain sensor installations with IIR, E/O and LRF functions that include teh ability to detect a man overboard at multiple nm. Personnel on the bridge can have a panoramic vision in visible and thermal (far IR) spectrum without anyone using one of those short mean time between failure short-range portable binos. See MIRADOR, for example. Portable equipment would at most matter in port, but I doubt that the on-deck watch would ever need it.